The NFL runs the show when it comes to major professional sports leagues, but these days, it’s also one of just a bunch of leagues vying for your support in the football arena. Does that mean the NFL is in trouble? Not really. Like it or not, the NFL is about as iconic as its most storied brands (think the Dallas Cowboys), and until it either folds on its own or the entire Earth caves in, it’s not likely we’re going to be talking about professional football without talking about the NFL. And yet, if you’re a football fan, it can get kind of confusing trying to keep track of all the other leagues. The National Football League is the one you know and love. Founded in 1920 as the American Professional Football Association (another stinkin’ name! ), it became the NFL in 1922, merged with the American Football League prior to the 1970 season to form the NFC and AFC conferences and has hosted Super Bowls as championships since then. It began with 14 teams and now includes 32, who play 16 regular-season games using standard American football rules. Oh, and its multi-billion-dollar business is the best in sports. The Canadian Football League is the only major professional football league in Canada. Founded in 1958 as a merger between two football unions, one of which originated as rugby-style football as early as the 1860s, it includes nine teams that play 18-game seasons and hosts Grey Cup championships at the end of each year. CFL rules permit more players and bigger fields in games. The Arena Football League is the third longest-running pro football league in North America behind the NFL and CFL. Founded in 1987, it peaked with 19 teams in the 2000s but now includes four that play 12-game seasons on smaller, walled-off fields with a faster style of play. From 2000-09, it had its own 25-team developmental league, the af2. 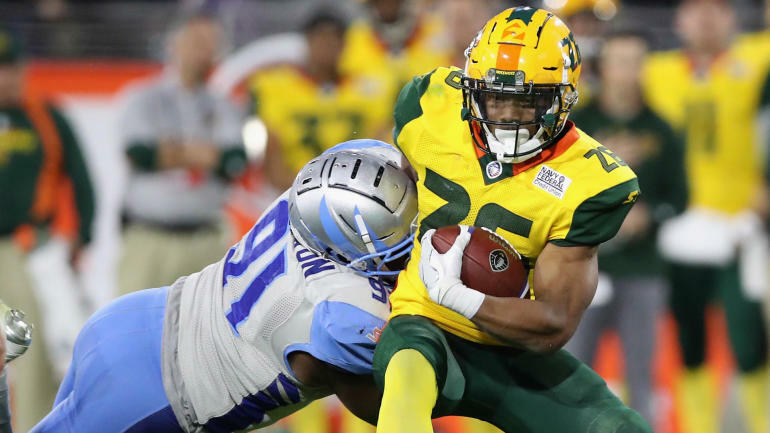 The Alliance of American Football is an unofficial complement to the NFL that debuted the week after Super Bowl LIII. Founded by Charlie Ebersol and former NFL executive Bill Polian with eight teams and a 10-game schedule into the spring, it features countless coaches and players with NFL roots and a faster-paced game without kickoffs or overtime field goals. Rosters took shape with regional allocation and an inaugural quarterback draft, while the game broadcasts — on CBS, CBS Sports Network and NFL Network — are built around a streamlined fantasy football game for fans. Among the big names in the league, which has representation in both college-football cities (like Birmingham) and former NFL sites (like San Diego), are coaches Mike Martz, Rick Neuheisel and Steve Spurrier, quarterback Garrett Gilbert and running back Trent Richardson. The XFL originally debuted in 2001 as a joint venture between NBC and WWE, lasting just one season as a rougher, wilder and less-talented version of NFL football during the spring. It’s now set for a 2020 return — with a much different tilt — under WWE CEO and original league founder Vince McMahon, who’s announced eight XFL-owned teams that will compete directly with the NFL under commissioner Oliver Luck. The American Flag Football League was founded in 2017 as the “American Idol” of flag football, an open-registration tournament pitting everyday athletes against professional teams. After a pilot debut starring ex-NFL stars like Michael Vick, Chad Johnson and Terrell Owens, the AFFL hosted its first U.S. Open of Flag Football on NFL Network in 2018, featuring four pro teams with former NFL, NBA and Olympic athletes. Pacific Pro Football is the joint creation of Don Yee, the agent for New England Patriots star Tom Brady, and Ed McCaffrey, a three-time Super Bowl champion and the father to Carolina Panthers’ Christian McCaffrey. It’s also the only pro league geared toward athletes too young for the NFL — specifically, players directly out of high school. Much like the NBA’s G-League or Major League Baseball’s minor-league systems, it’s designed to act as a developmental step toward the NFL. It’s set for a July 2020 debut with four teams in Southern California. The Freedom Football League is another upcoming spring league mirroring NFL rules. Former players Jeff Garcia, Terrell Owens and Simeon Rice are among 100 stakeholders for the surprise 10-team league, ex-NFL star Ricky Williams announced, which will make season-ticket-holding fans “part-owners.” Filling soon-to-be NFL voids like Oakland and St. Louis, it promises “economic justice” through its joint ownership structure. The Indoor Football League kicked off in 2009 during a one-year shutdown of the Arena Football League, and since then, it has become the AFL’s chief competition. Formed out of a merger between the Intense Football League and United Indoor Football (yes, seriously), the IFL includes 10 teams — some of which were pillaged from the AFL — playing 14-game seasons. The Spring League was founded in 2016 and debuted in 2017 as an “instructional league” and unofficial showcase for NFL and CFL scouts, with four teams playing fall and spring tournaments. Home for ex-NFL quarterback Johnny Manziel in 2018, it is set to serve as a potential bridge to AAF and XFL rosters in the coming years. UFL: The United Football League targeted non-NFL markets like Omaha and Las Vegas and timed its 2009-12 run over a brief NFL lockout, hosting a total of six franchises before folding.